Every time you add money to a Budget account, it appears in To be Budgeted. The next time you sit down for some quality time with your budget and our prioritization strategy (spoiler – work down the list of categories), assign each of those dollars to a job. And we mean each dollar. Until your To be Budgeted amount is $0.00. All of ‘em. You have three ways to get your dollars where they need to be. You should try them all. You may have a favorite (but don’t tell the other one if you do). Look out for GIF's below! Do you see any orange category balances in your budget? An orange category means you’re underfunded and the icon in the orange bubble can help you understand why. You can cover all types of underfunding in all categories with a single click. Find that button in the Inspector (over on the right!) and click away. Done. You can do this one category at a time or one category group at a time by selecting those categories. 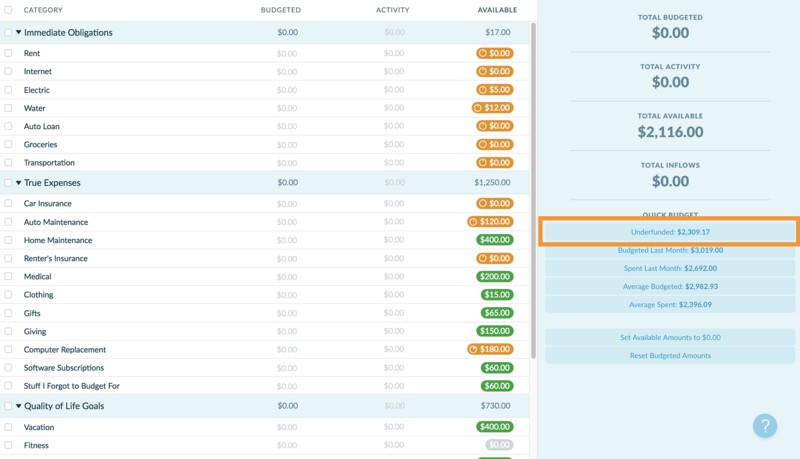 Or you can cover all underfunding in your budget at once by clicking the Underfunded Quick Budget button with no categories selected. When you have a little bit of history in your budget, you’ll be able to jump start based on spending averages and other historical whiz-bangs. But that’s jumping ahead. You can type a number of dollars right in your category. Need $90.00 for that cat toys category you just created? (Do you? Really?) Just type $90 there and move onto the next one. You can also just click on To be Budgeted, enter the amount you want to move, select the category, and boom! Dollars are budgeted. This one is especially handy when you already have $73.91 budgeted to a category and you want to add $18.76 more – and you loathe arithmetic. It’s okay, Move Money has you covered.